I love my sister-in-law, Sue. For many reasons. She reminds me a lot of my husband (her brother, L.) She's an incredible mom, friend, sister and educator. And she turned me on to this Asian-inspired noodle salad. She made this for one of her infamous parties. It's one of those foods at a buffet that you try and think "Oh, right. Excuse me, while I load up on this salad before everyone else discovers this and it's gone." I was hooked. It's a cool, perfect balance of crisp vegetables, al dente noodles and creamy/salty peanut butter with a kick of heat. This weekend, I was craving this salad. The weather here in Seattle has been uneven (rainy/sunny/cool/warm all in one day) and while I don't want hot comfort food yet, I don't have that same love for cold lettuce-based salads as I did this summer. After a quick trip to the market, I tossed this together in a few minutes and let it cool while I started taking in the summer decorations from the deck. By the time I was finished packing everything away and had showered, the flavors in this salad were perfectly melded. I served this for dinner last night with a simple sparkling water with lime and L. loved it as much as I did. This is a great salad for taking to lunch or for buffets. It makes a large amount and stores well in the fridge. You can also add your favorite ingredients to the recipe. I added shredded chicken but this can easily be made vegetarian by omitting the meat or adding tofu. I like the the simple taste of orange (or red) bell peppers with carrots and green onions but you can also add broccoli, snow peas or whatever vegetables make you happy. 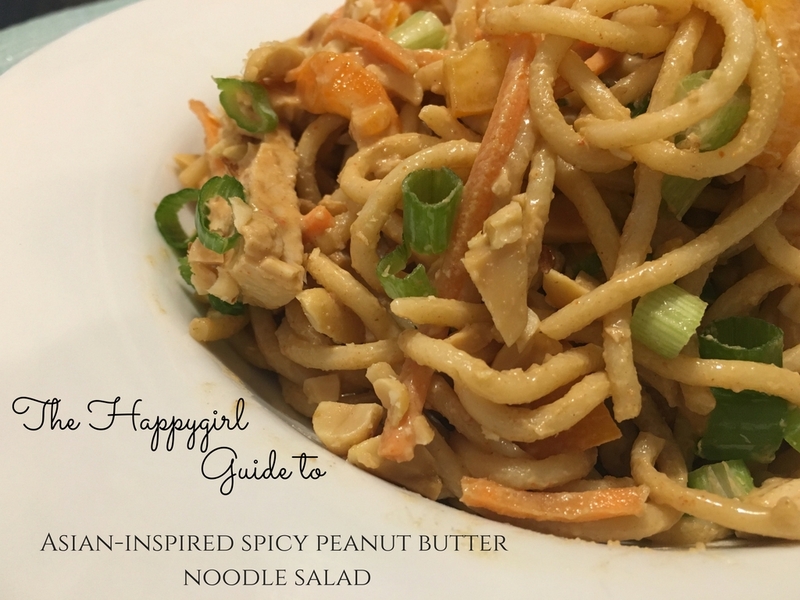 This Asian-inspired cool, spicy noodle salad is a perfectly balanced mix of crisp vegetables, al dente noodles, protein (chicken, pork or tofu) in a spicy, creamy peanut butter dressing with a hint of refreshing lime. This is great cooled after several hours but even better the next day for lunch. In large bowl add cooked noodles, pepper, carrots, green onion. Add protein (cooked chicken, pork or tofu.) Set aside.In another bowl, combine vinegar, sesame oil, soy sauce, peanut butter, cayenne pepper, lime juice, water, sugar and ginger. Whisk until smooth. Pour over noodle mixture. Toss to incorporate sauce and noodles.Refrigerate for 3 hours until cold. When serving, sprinkle with chopped peanuts.For a quicker assembly, buy pre-cooked protein and chopped vegetables.